Marisha Robinsky has been serving home sellers and buyers since 1987, and her negotiating and marketing shows her long experience. Her clients' testimonials give credit not only to her skills, but also to her patience, her knowledge of the Toronto real estate market, and her enthusiasm. 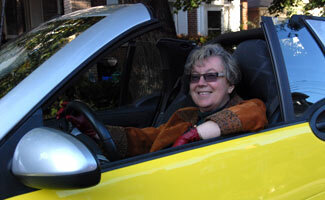 To limit her carbon footprint Marisha drives a SMART convertible. Her SMART is bright yellow, and is easy to follow when she needs to take out more than one buyer. Marisha's interest in lofts dates from the time, many years ago, when her son was looking for a place of his own and wanted to buy a hard loft. Finding him a loft he liked and could afford was a challenge and took some time. Marisha will be happy to offer you advice and information about various Loft buildings and about Toronto neighbourhoods and loft-related resources. We understand the complexities of real estate transactions and we are familiar with all aspects of home buying and selling. We also have access to legal advisors, experts on mortgages, specialists in construction, engineering, home inspection, architectural and environmental issues.